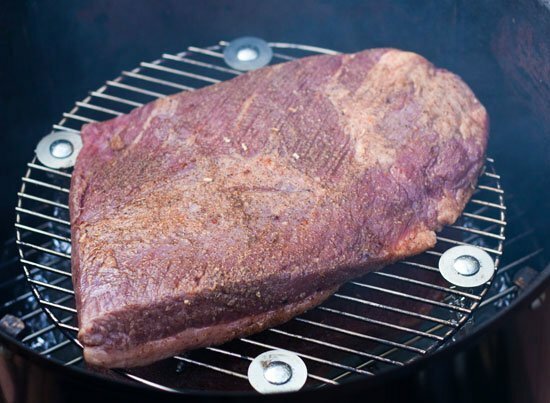 To Foil or Not to Foil a Beef Brisket? I’ve been talking a lot about this big BBQ coming up at my house for my daughter’s birthday. I know that I want to smoke briskets and for serving purposes I am leaning towards the untrimmed brisket flats. 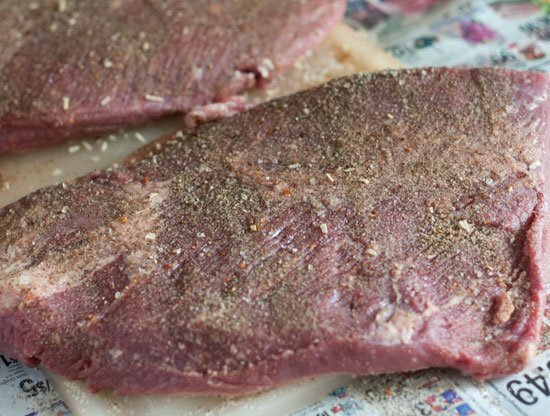 The untrimmed brisket flat is just the flat portion of the brisket and it doesn’t have the point so all of the meat can be sliced. When you buy it untrimmed it comes with a 1/4 inch of fat on the bottom which is much better than the standard grocery store trimmed brisket flat which barely has any fat. You need all that fat on there to keep the meat moist since it will be smoking for so long. It turns out that Costco sells these untrimmed flats in their original cryovac for really cheap. I got two 6 lb brisket flats for about $32 total. The point of today’s exercise is to determine which brisket is better: one that has been foiled (i.e., the Texas Crutch), or one that has spent all of its time on the smoker with no foil. The results of this little test might surprise you. The goal here was to test two methods of smoking a brisket and then use the method which yields the most tender brisket for my upcoming party. Put brisket on the smoker. When the internal temperature of the brisket reaches 160 degrees wrap it in foil and continue to cook until about 200 degrees. Put brisket on the smoker and smoke until it is tender (about 200 degrees internal temperature). At 7AM I put the brisket rub on both brisket flats and let them sit at room temperature while I got the smoker up and running. I know a lot of people who put the dry rub on the night before and this is fine. I’m just not so sure that I can really taste the difference. 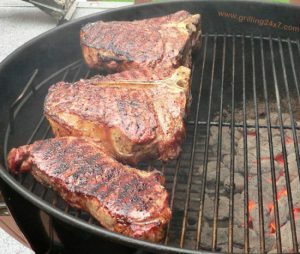 I find it much easier and less to clean up to just add the rub in the morning before the smoke. I got the smoker up to temperature rather quickly and added the briskets to the bottom grate and “middle grate” of my Weber Smokey Mountain Smoker. I wanted to leave the top grate empty since for the party this grate will be full of pork shoulders. As you can see from the table above, the foiling really accelerates the cooking time. Within one hour of foiling the two briskets had an internal temperature difference of about 20 degrees! Wow! At 1PM the Method 1 brisket was foiled and it was finished cooking by 3:30! I took it off the smoker with an internal temperature of 198 degrees. I wrapped this brisket with some more foil and kept it in a cool oven to rest for an hour or so prior to slicing. The method 2 brisket remained on the smoker for another 3 hours. It really developed a nice bark and surprisingly stayed moist on the exterior with no mopping. At 6 PM this brisket reached 201 degrees internal temperature so I took it off the smoker and wrapped it tight in foil and let it rest in a cool oven for an hour prior to slicing. 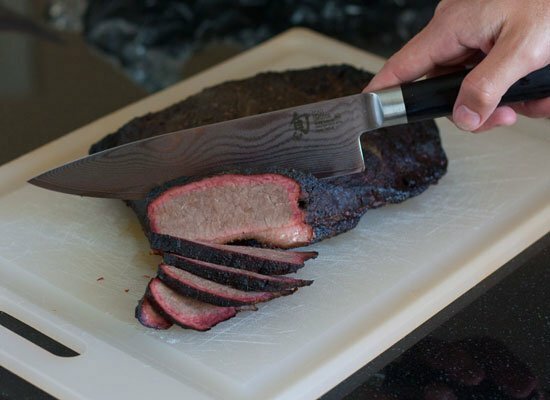 Oh the moment we have been waiting for: slicing the brisket flat! Since the brisket was so tender it would have been easy to shred apart but I managed to slice the brisket pretty well. When I was comparing the brisket methods one stood out as the winner. The no foil Method 2 was so much more tender and had a much better bark and smokey flavor. The foiled method was a bit tougher. It reminded me slightly of pot roast. Now, I don’t want to say that it wasn’t good, I mean it did make a great brisket sandwich! However, when compared to the no foil brisket it didn’t have a chance. Now multiple issues could be at play here and by no means is this conclusive evidence that foiling a brisket is a no no. The first thing that stands out to me is finishing temperature. I took the foiled brisket off the smoker at 198 while I took the no foil brisket off at 201. According to the BBQ world this is a big difference and it’s right in the region of temperature debate. Some people pull briskets off the heat in the 190s and some pull them off the smoker in the 200s. From now on I’ll be aiming for 201! The no foil brisket that finished at 201 degrees and was allowed to rest for 1 hour prior to slicing was amazing. One other thing that was different between the two briskets is that the no foil brisket was positioned under the foiled brisket. For the first 5 hours the fat from the brisket on top was dripping down on this brisket. Of course after foiling the dripping stopped but perhaps there could be some added moisture from this dripping process. For my purposes I was able to make amazing brisket slices by doing the following: Dry rub at 7AM, put the brisket on the smoker at 8AM. Remove the brisket when the internal temperature reaches 201 (6PM) and wrap tight in foil for one hour prior to slicing. When reheating the next day use a 275 degree oven for one hour and reheat it with BBQ sauce and grated butter. That’s my plan! I also wanted to test both briskets the next day. This cooking time shown above doesn’t really work well with a party unless you want to start smoking at 2AM. Most of the time my plan is to smoke on a Saturday for a Sunday party so this is what I wanted to recreate here. 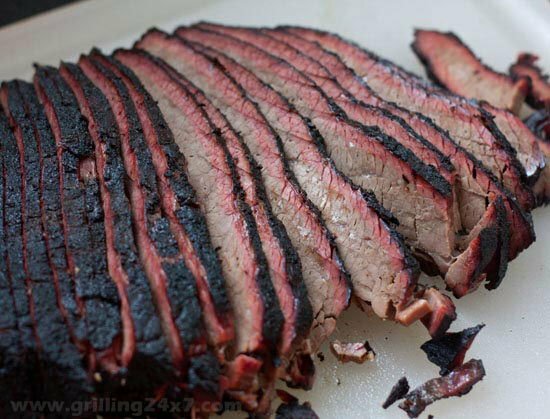 The next day I put the refrigerated brisket slices in a 275 degree oven for 1 hour. I generously applied my whiskey BBQ sauce to the brisket and I also used a cheese grater and grated some cold butter over top before it went into the oven. I’m a bit hesitant on reheating brisket with no sauce. I think you need moisture during the reheat or else you risk drying out your tender brisket. I used a foil tin and tightly sealed it with more foil. I think this allows the brisket to steam a bit during the reheat. Disclaimer: I’m well aware that brisket is very tricky to cook. While foiling didn’t work out well for me here I know for a fact that many pro BBQ teams swear by it. All I’m saying above is that for my setup I’m going to skip the foil… for now. 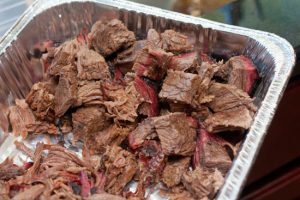 It is also important to note that reheating the leftover brisket the next day can take tough – not so great- brisket and make it really good the next day. So if you are upset that your brisket is a bit tough do the above reheat trick the following day and I bet it will fall apart and be amazing for you. 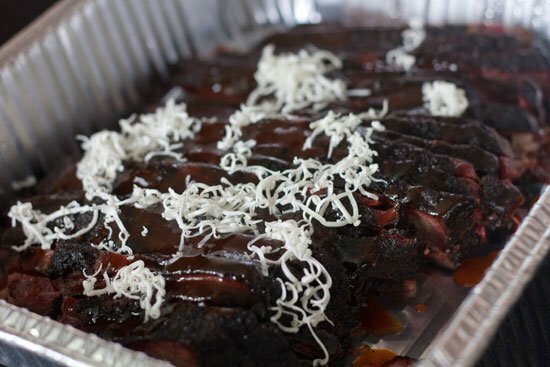 You might also want to try smoking a packer brisket. 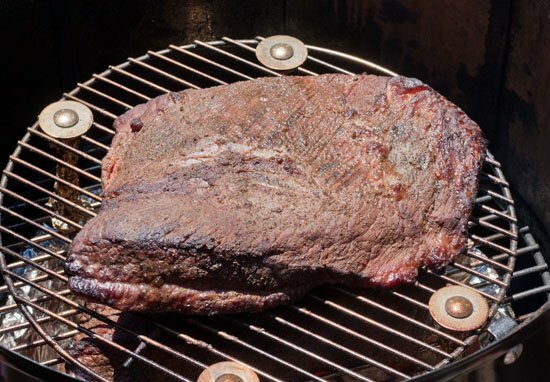 Here’s an article on how to smoke a packer brisket on an ugly drum smoker. 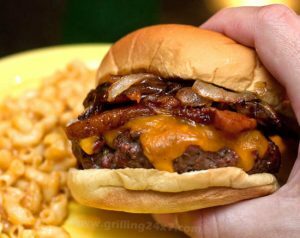 What is a Pub Burger? How much charcoal to use? Thanks for this, I’ve just learned about the Texas Crutch method. We had briskets hit a stall and didn’t know what to do or why it happened. The article I read said to use peach paper to allow the brisket to breath and retail moisture at the same time. I’m going to try that next time if I can get my hands on this peach paper! Thanks again, really appreciate all the time you took to list the results. Thanks, your cooking was right on. I live in Texas and have foiled my briskest for some 40 years. I have cooked up to 8 briskest at a time for church and get togethers. My wife declares the best briskests are the unfoiled as the bark is better and the smoke flavor is better. 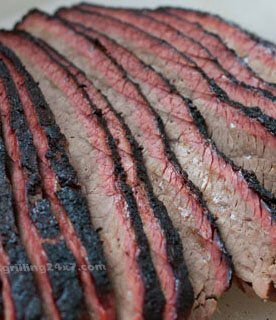 I do not like any kind of trimmed brisket so the moisture has never really been a problem. I do put my cooked briskests in a cooler and this keeps them steaming hot for 8-10 hours. 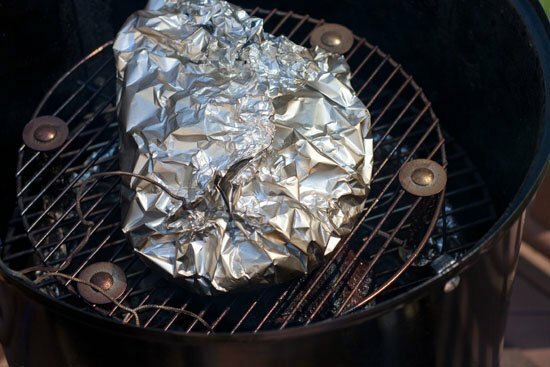 If I ever reheat the meat I totally soak a rag with water, lay it on top of the meat and seal with foil. This steams and tenderizes the meat. Great article. That is correct David. Either method can make perfect brisket. It is all about being consistent with the approach. Foiling it means you have to keep it moist so spritz apple juice before it goes in. From start to finish I spritzed about a cup and a quarter of apple juice on the brisket every hour during smoking and before crutch time and pouref some into the texas crutch. It turned out perfect. This is an interesting experiment. But those briskets were not cooked at the same temperatures. The brisket that ended up being foiled was on a higher grate than the other one. The temp was higher on the higher grate. I don’t know of the this had any result on your conclusions, but it’s true that they were really not cooked or similar situations prior to the tile brisket being wrapped.